- Measurement: CO2, temp. and humidity. - The selection of °C or °F. - Temp sensor : Diode. - Humidity Sensor : Capacitor Sensor. - Sampling : 1 times/second. - Power : AC to DC Adapter. - Backup Power : 9V battery,NEDA 1604, IEC 6F22 or JIS 006P( for data logger use). - Resolution :1ppm, 0.1%RH, 0.1°C, 0.1°F. - Standard Accessories : User’s manual, 9V battery, AC to DC Adapter,Carrying case, LCD Wall Mount kit. 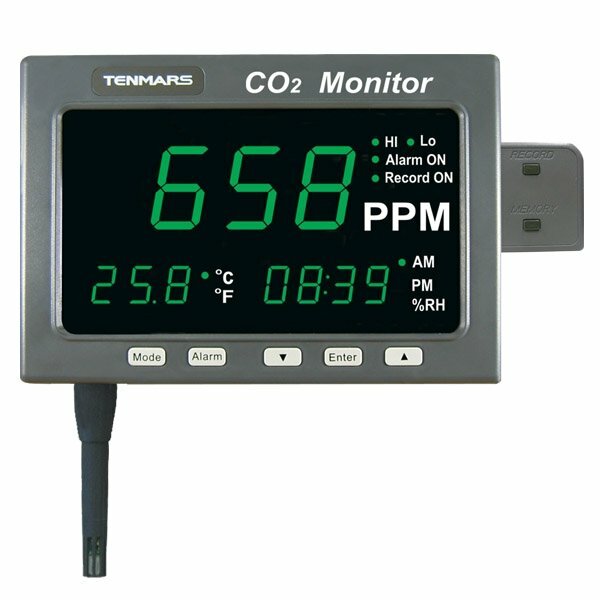 - Accessories : Data logging Box (TM-186D & TM-187D).